Half Alphabet challenge (cache names): Alphabet Challenge caches are rather common throughout North America on Geocaching.com, but lets face it, we have less than 2,000 active listings as of the publication date of this cache. So rather than finding at least one cache using all 26 letters of the alphabet (as defined by the first letter of the cache name), you need only 13, or half the letters of the alphabet for this challenge. Verification: Please post your qualifying finds with your log, preferably in the http://coord.eu/OUXXXX format, and also keep in mind you can link to cache pages using our cache log editor, although is not mandatory. We will also accept a GSAK or GeoGet screen shot. To see if you qualify, you can just look through your list of finds in your profile, but keep in mind, we do have the equivalent of a Groundspeak "my finds pocket query", (instructions here) and that .gpx file is easily imported into GSAK, or any similar stats program. We recommend a "gpx gc" file, and we also recommend GeoGet as a free alternative to GSAK, should you not be a paid full version user of GSAK. Here's 14 of my finds! I qualify (BARELY)!!!! Here is my count, and screenshot of find list will be uploaded. Thanks! Much to my own surprise, I qualify. 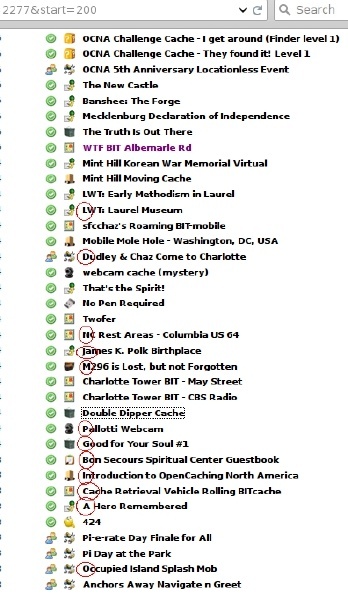 In fact, I listed 15 caches just to be safe. Here's my list...thanks for the challenge!